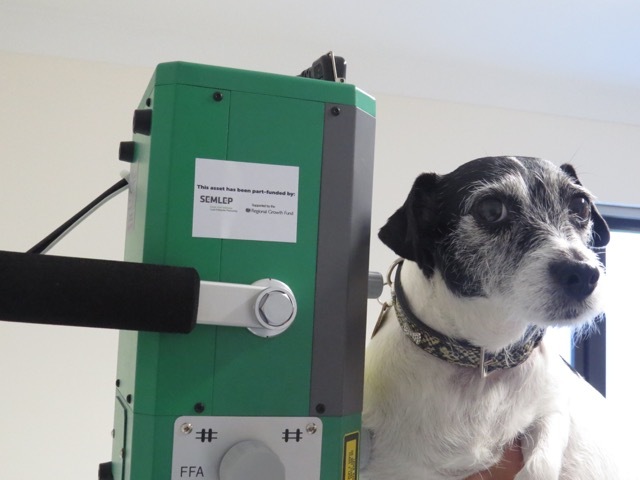 State-of-the-art blood analysis equipment part-funded by Velocity has helped save the life of Lily – a dog with a potentially life-threatening form of anaemia. The tiny terrier has suffered from a condition known as Canine Immune-Mediated Hemolytic Anemia (IMHA) – which saw Lily’s immune system destroy her own red blood cells. Thanks to a blood analysis machine part-funded by a Velocity grant, the team at Corby Vets quickly diagnosed the potentially fatal condition and were able to save her life. The equipment formed part of a major investment into pioneering technology by the practice when it expanded into new premises earlier this year. Other purchases made as part of an £8,000 grant from Velocity included an X-ray machine, a moveable examination table and a dental machine. Velocity was recommended to Director Nick Park by a colleague and, following an initial meeting, it was agreed that funding could be available. Velocity business adviser Andrew Rozzier helped throughout the application process and within weeks the money was in the account, allowing the team to invest in the equipment they needed to provide a first-class veterinary service to the people of Corby and the surrounding villages. Mr Park said: “The Velocity funding has been a huge help and I can’t recommend them highly enough. This technology has made a big difference, it ensures we can give our patients the best possible service. The practice currently sees around 50 patients every week, employing five staff. Since adding the Corby site to its existing practices in Oundle and Thrapston, Velocity business advisers have continued to help develop the business by offering bespoke one-to-one support. The focus is now moving to testing digital advertising and increasing the practice’s online presence, while the team are continuing to explore possible collaborations with other related businesses such as dog grooming, dog walking, dog/cat boarding and with insurance companies who provide pet owners with cover for those occasions where their pet becomes ill.